A great day of fun for everyone. Beach Road closed from 3:30 p.m. 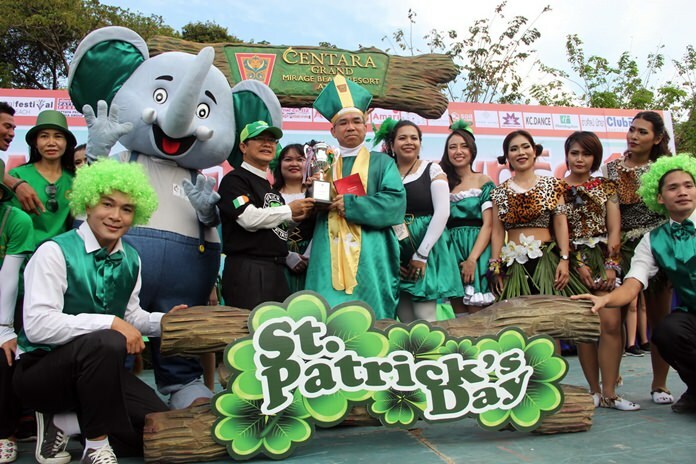 The eighth Pattaya St. Patrick’s Day Parade will be taking place this year on the afternoon of Saturday 17th March. Traffic will be closed from 3:30 p.m. along the parade route from Alcazar down Soi 4 and along Beach Road to Pattaya School No. 8. More than 30 businesses are expected to take part with elaborate floats. Entry fees and donations will go the Father Ray schools and shelters. St. Patrick is the patron saint of Ireland, and his feast day is celebrated around the world. Celebrations will be taking place in cities from New York to New Zealand, Beijing to Dubai and from Moscow to Sydney. In towns and villages throughout Ireland people will be celebrating, and of course, here in Pattaya, the St. Patrick’s Day Parade continues to get bigger each year. The annual parade, which is organized jointly by City Hall, the Irish Society of Pattaya and the Father Ray Foundation, is honoured that once again His Excellency Mr. Brendan Rogers, Ambassador at the Embassy of Ireland in Bangkok will be in town to lead the parade. The festivities to celebrate St. Patrick’s Day will start at Alcazar Theater at 15:00 with the raising of the flags and the singing of the national anthems of Thailand and Ireland. The Parade will start at 15:45 and proceed from Alcazar Theater down soi 4, then along Beach Road, turning left on South Pattaya Road and ending on the grounds of Pattaya School No. 8. There will be several marching bands, including the musicians from the Royal Thai Navy. A cast of thousands, young and old, Thai and foreign will march along Beach Road and be joined by many decorated floats. You don’t have to be Irish to celebrate St. Patrick’s Day; on the 17th of March everyone is Irish, just remember to wear something green.